Endgame: 1992 & 2002 or 1994 & 2004? Weigh in! What dates do you go with for Endgame's present and "10 years ago"? As I recall, the original idea from TPTB was that it was 1990 and 2000 (I think those were even the dates on screen in the theatrical? ), but that wouldn't work for the obvious reason of Connor's presence in "The Gathering" in 1992 in season 1. For the producer's cut it was changed to "10 Years Ago" and "Present Day," being more coy about things but with "the idea that it is 1992 & 2002." But that doesn't really work. The only Christmas time Duncan was in Paris was around "Star Crossed" in season 3, and that was 1994. There is also the caveat that as long as Endgame is set in 1994 & 2004, it is fully compatible with Highlander 3 (minus the pesky talk about their being the last Immortals and all of that, but you have to minus that from the first movie, too, anyway). Look, lets forget HL3 for a moment. The key, is the opening flashback sequence. Season 3's "Song of the Executioner" clearly states Joe's bar having closed in November of '94. Shortly thereafter, Duncan leaves Seacouver behind and moves to Paris again. Now, the only statement of Fitzcairn's passing as shown in the very next episode, "Star-Crossed", has him dying in '95, which is a good indicator that between November of '94 and March (?) of '95, Duncan could've arrived in Paris and left again before "Star Crossed", maklng that episode a "direct" follow-up to Rachel's death and Connor's disappearing, from a timeline perspective. That's it. Anything else is just not relevatory. I mean, obviously Panzer liked the idea of 1992-2002 because that way, Endgame occurs roughly a decade after the show's premiere, but... is it really that important a difference? THAT BEING SAID.... I'm a much, much bigger fan of the 1994-1999 idea that Tootsie Bee promoted a long time ago... and it makes sense to me, as it combines the above dating of the show WITH the film's release, which was a year after, in 2000. Makes sense to me. 1990 and 2000. The screen says, "Ten Years Ago." The movie came out in 2000. Simple as that. Yes, it contradicts the TV series, but so does Kate. The easiest way to understand it is to regard the first episode of the show as semi-apocryphal, namely Connor's present day appearances. Why exactly does it matter when the movie came out? Because that's what the words "Ten Years Ago" naturally refer to in a film. Song of the Executioner and Star-Crossed are both in November 1994. Fitzcairn's death was exactly a week after Paul's. The events of Methos are in March 1995. I have the entire timeline for this season -- including the realities of Anne's pregnancy and Kalas' imprisonment -- all ironed out. Will share the info for those interested in such things. The original premise of Endgame was that it was to coincide with the then-present day year of 2000, its present-day stuff being in December 2000 with the flashback being to December 1990, prior to Christmas. The official Highlander: Endgame website said as much. With the assistance of the 1996 and 1998 Watcher Chronicles CD-ROMs, it was established in the Series that Duncan had permanently moved to Seacouver from Paris sometime between January and July 1988, where he stayed until February through June 1993. Then you had the requisite back and forth between Paris and Seacouver for Seasons Two through Five. Moving the December 1990 flashback to December 1992 doesn't resolve the issue of Duncan not living/being in Paris at that time as his dialogue to Connor indicated that he did. Filming the Vancouver segment of Season One ended in November 1992 and filming of the Paris segment commenced in December 1992, but at times, the actual overall story they were creating didn't always line up with the dates of filming as revealed by the Watcher Chronicles. In moving the December 1990 flashback to December 1994, you do solve the issue of Duncan's line of dialogue to Connor about him having been in Paris when Connor summoned him to New York, because, as noted above, Duncan left Seacouver for Paris in November 1994. I am actually onboard with this particular change, and it is fortunate that we can safely place that there. However, I'm not too keen on moving the present-day stuff to December 2002 -- but especially to December 2004. If you leave it all in 2000, then it makes the stated 10-year span a mere 6 years, which is even more preposterous that Duncan would have cared that he hadn't seen Connor in such a small amount of time. But at least then the timeline could still otherwise be correct and you'd still have a valid setting in which the World Trade Center is still standing and folks drove cars with more feasible year models. If you move it to 2002 or 2004, then even more suspension of disbelief is required since no one is driving cars later than 1999 models even though you're saying that it's now 2002 or 2004 (to say nothing about the WTC still standing). Also to think about is the sign that Methos, Joe, and Duncan pass along the interstate on the way to Connor's supposed grave that mentions the Governor of Connecticut being John G. Rowland. Rowland was not the Governor of Connecticut after 1 July 2004, so we can't really say that these events were in December 2004. The way to fix this, in my opinion, is to leave the present-day setting in December 2000 (as was its original intention), have the flashback be in December 1994, and create a fan edit of the film wherein Duncan tells Methos that his bloody nightmares occurred 6 years to the day from when Connor disappeared instead of 10. There is at least one instance of Duncan saying the number "6" in the Series, so I think it could work. Shouldn't be too hard to dub over, I wouldn't think. Aleander, you on this? There is the "10 years to the day" comment in the movie. No matter which way you shift things, it's 10 years. Not 9, not 8. That's why, in my fan-edit, I fixed that, and made the line "five years to the day." That way, you have 1994 to 1999 without much of a fuss. But as it is, we just have to assume that the WTC wasn't demolished in 2001. That there wasn't a 9/11, at least not until later. Its a feasible assumption that has to be made given the visual circumstances. Also, Andy, the Watcher Chronicles show Fitz's death in 1995, I believe? I'm not certain. Last edited by Aleander; 06-11-2017, 04:29 AM. Now, the whole idea that Duncan should be bothered by not having seen Connor in a decade is really preposterous, in my opinion; they were never joined at the hip after first parting ways in 1634, so I'm sure there were plenty of decades that went by in their lives where they didn't see each other. The Gathering wasn't occurring circa 1634. It was occurring in the 1990s, however. That's a potentially significant difference. But yeah, my preferred dates are December 1994/1999. Duncan is upset over Connor's disappearance because of Kalas, and the feeling never quite goes away. Good point. Plus, Duncan knows what Rachel meant to Connor. He has no idea what did Connor do about it - did he flee, seek to persue the killer and die in the process? No clue. Well yeah, if you physically go in there and change spoken dialogue and stuff, it can be 1994/1999. It can be anything you want. It can't be very long. The film came out in 2000. And Joe's very close to his age in the show. I rewatched the Producers' Cut yesterday, and the only place I'm sure I saw it was in the shot identifying the "Present Day." (It had also been in the identifying shot for "Ten Years Ago," but that of course poses no problem.) I'm not sure whether one street-at-night shot included the WTC or other tall buildings. And I don't think I saw it in the night-ttime sequence where Duncan took Connor's head - if it was in the background, probably no one else would have seen it either. I certainly don't think that's any reason for using the years 1990 and 2000! We all have scenes we don't like, and would delete or change if we could. (With me, it's been the entire first scene in the Producers' Cut... the entire last scene...and the omission of Methos's original statement that the Sanctuary was on holy ground.) Now I'd also say that "Present Day" identifying shot should be cut, and some other scene be used with a simple voiceover for "Present Day." And to make the identifiers match, the same should be done with "Ten Years Ago." To make "1990 and 2000" work, we'd have to ignore the all-important pilot episode of HL:TS. We could only justiy that by considering HL:TS and Endgame as taking place in totally different universes. And then, we'd have a situation where the film wouldn't explain who Joe and Methos are, let alone how Duncan knows them! The very existence of the Watchers would be unexplained. I think the point is to try and make things fit a well as possible, not remake the entire movie. (Although if Aleander finishes his Fan edit I'd probably reconsider) So 1994 to 2004 fits the best. But since when does a vague onscreen date ALWAYS have to conform to real life? This is a fictional universe, after all, and as such exists in a potential state of fictional timelessness, unconnected to the exact minutiae of "our" reality -- for example, many people instantly assumed that Terminator 2: Judgment Day must obviously take place in the "present day" of its year of release (1991), but in reality it occurs circa 1996-97, due to John Connor's age (plus the police-scanner data pulled up by the T-1000). To absolutely insist that an onscreen date automatically conform to year-of-release places a severe restriction on the storytelling techniques that the creators can bring to the table. Yup, it's clear that 9/11 didn't happen the exact same way (or even at all?) in the Highlander universe, and indeed, why should be instantly assume that the two universes are necessarily identical in every single way anyhow? As we all know, the Immortals do not exist in "our" universe, which means that their fictional universe can deviate in ways both minor and significant from ours. Last edited by Leto II; 06-27-2017, 04:02 PM. You just compared a movie with an onscreen date (albeit an obscure one) to a movie with a "Present Day" tag. I stand by my point. The closest thing we have to an onscreen date in Endgame *is* the WTC, tragically. Last edited by Tootsie Bee; 06-28-2017, 05:50 AM. It's the "present day" of the characters, in their fictitious universe, is the point I was making, there -- for example, in the Terry Gilliam film 12 Monkeys, the future era in which Bruce Willis's character resides decades hence is constantly referred to as the "present day," and there's even an onscreen title card referring to this as such. And there are other similar examples in movies and television, as well. In Hollywood, saying something occurs in the "present day" has long been an unreliable device for determining true narrative-chronology. Given that the Highlander universe is a completely fictitious universe (since Immortals don't exist in our world), it's not necessarily bound by our "own" history, which would open up totally new storytelling avenues for the creators, if they wish. Indeed, for example, we could get a story where, in the Highlander continuum, a group of Immortals managed to prevent 9/11 from even happening, which could go in all sorts of cool and interesting new directions afterwards. 2004 (or even 2002) and the WTC is seen in the background. Well, that's one of those things you have to just overlook. It's not like the producers foresaw the WTCs falling when they were filming in 1999, nor did they intend to make Endgame in an alternate universe where real life events don't happen. No, I don't they intended that. However, its also too large an event to simply ignore or wave over. 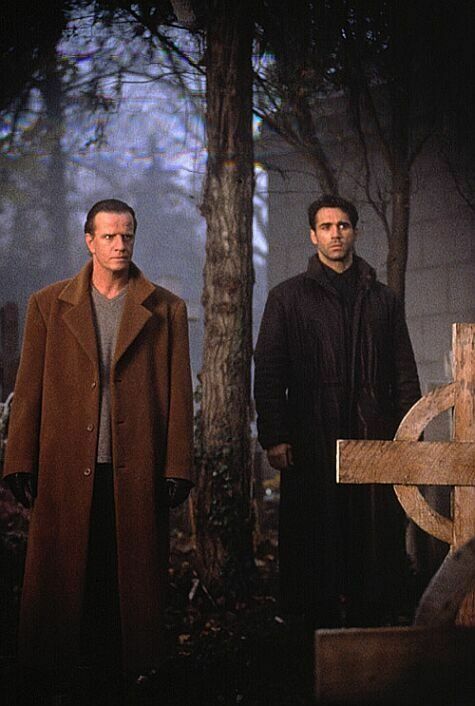 Its better to just see the Highlander universe as one that diverges from ours from around that point. Especially given the Dynamite Comics series, which has the world falling into chaos and a massive nuclear detonation occurring in North Africa, in the year 2012, as part of the Duncan-verse. It's definitely divergent from our own at this point. I think a core cause of the headaches is that the theatrical cut, at least, isn't really a follow-up to the TV series. It's a movie that borrows elements from the first movie and the TV series, which isn't exactly the same thing. Dimension didn't care whether or not Duncan had ever been married. They didn't care whether or not Connor appeared in the first episode. They were like Jacob Kell: "I don't care about the rules." That's why their website said that the movie happened in 2000. Bill and Peter, on the other hand, kinda-sorta cared, which is why their Producers' Cut is indeed a sequel to the TV series, albeit a flawed one that fails to fix all of the continuity problems that were introduced in the original version of the film. And yet, the official word is not on the film itself. Its the same argument about Ramirez's death - 1541 or 1542? Who cares, really. Personally I prefer the latter, cause it gives more time for Connor and Ramirez to bond, but either way, its not wrong when, say, a comic makes a reference to the latter date instead of the earlier date. Its a retcon, but not a visual one, and one thats not as offensive as you might think. That being said, I remember reading a curious interview with CL that said that very same thing - that the film wasn't a sequel to the TV or any of the film, but rather it just brought those two characters together in a story. To this day, I've no idea what he meant by it, and of course I can't verify it by now, but I do remember reading it. Strange. 1542 was a very bad year. Catherine Howard was executed for adultery. Solway Moss drove James to an early grave. And Charles began a war with the king of France.